The death of a family pet is often the first death experienced by a child. Children have very special relationships with their pets and, although children experience grief differently than adults, they do grieve the passing of their friend. They need support and guidance to understand their loss, to mourn that loss, and to find ways to remember and memorialize their deceased loved one. 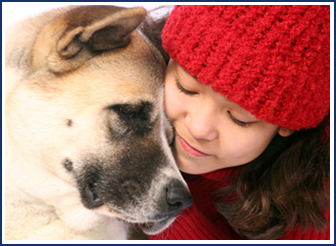 There are many resources available to help children with pet loss and grief. Unless euthanasia occurs in an emergency situation, it is wise to prepare children ahead of time. Their pet should not simply disappear. If they are prepared for the experience, children are usually able to more readily move through the grieving process and accept the loss of their pet. Ultimately, you, as a parent or caregiver, know your child best and must use your discretion in deciding whether you believe your child will benefit by being present to say goodbye to their friend. We will respect your decision either way. If you do choose to include your children, we will strive to accommodate their needs during this difficult time. Many owners wish for their other family pets to be present to say goodbye. There is no evidence that allowing surviving pets to see the passing of their companion and/or to see and smell him or her body afterwards helps them. However, it is often a comfort to the family to have other family pets share this time with them. Pets are welcome during the appointment as long as they are well-behaved and not compromising the experience for the family or impeding the ability of the veterinarian to safely carry out the procedure. Although being present during the euthanasia may not have an effect on a surviving pet, the absence of their friend in their life will typically have a noticeable impact. Animals form strong attachments to each other and usually appear to experience grief with the loss of their companion. Owners should expect behavioral changes in their remaining pets, including many of the same symptoms experienced by the bereaved pet owners, themselves. The surviving pet(s) may become anxious, restless and depressed. The grieving pets may search for their missing companion. They may isolate themselves or may crave more attention from their owner. Sleep and eating disturbances are often observed. The article, “Helping a Pet Grieve” by Laurel Lagoni, M.S., provides beneficial information on approaches to take with a pet showing these signs. 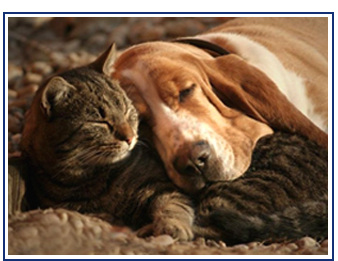 If your animal is not eating or drinking following the loss of a companion, your veterinarian should be consulted.